One of my favorite stills from the film. The subtle beauty of the weave, the dark and light shadows. Tenganan villager wearing a traditional double ikat. Bali, Indonesia. In this short documentary commissioned by the Asian Art Museum of San Francisco, Studio Galli travels to the Balinese village of Tenganan to discover how double ikat textiles, known as geringsing, are made. Gering means "sick" and sing means "no." According to ancient Balinese legend, Geringsing are prized for their ability to ward off evil and sickness. There are few village communities in the world today who can still produce high grade double ikat. The pattern is transferred to the individual yarns before weaving. Normally only one direction carries the pattern -- either the warp or the weft; having the pattern flow in both the warp and the weft means there must be tight control in both the marking of the patterns in the yarns, the resist dyeing process, as well as the tension during the weaving to create precise looking imagery. A prized example of Balinese Double Ikat. Note the resemblance to Indian Patola trade textiles which influenced the patterning. Thanks to the Tenganan Villagers for participating in this film. As with many native handicraft, the value is derived in the complexity of the process and the years of skill required to become a master artist. Tirta Gangga Water Gardens of Bali -- not to be missed! Bali is a wonderful island, it was a great opportunity to explore the mountain jungles and stay in some incredible accommodations. We would gladly return! Special thanks to Rai Artha Made who assisted in the creation of this video. Saka Resort Bali -- Andrew's favorite! One year later, we were able to share our appreciation with the village communities of Bali who gave their time and shared their knowledge of this craft with is, by presenting them each with a special DVD of their performance, paid for by the SF Asian Art Museum. 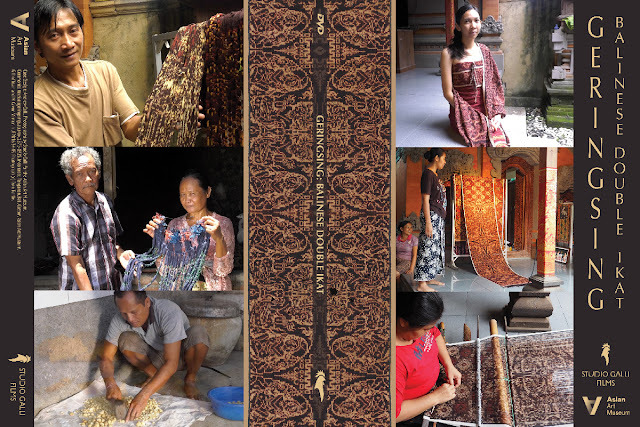 While not available from us, I am sharing the beautiful case cover we designed for this commemorative DVD for the weavers of Bali. Case Jacket for Commemorative DVD.